Fans of indie rock, get ready for a treat – The Decemberists are on tour! Bringing their unique brand of baroque pop on the road once again, the 5-piece band will hit the Fox Theater Oakland on Thursday 17th August 2017 for a show you’ll never forget!! 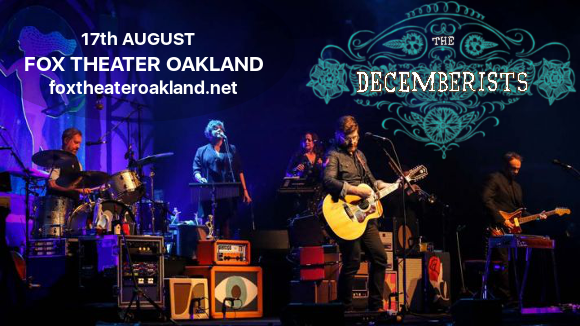 Tickets are in high demand, so don’t delay – book your tickets to see The Decemberists early, while they last!!! Formed in 2000 and releasing their debut EP, “5 Songs,” in 2001, The Decemberists quickly gained a devoted fanbase for their musical style, combining modern rock and pop sounds with more traditional folk instrumentation, and ye-olde worlde lyrical content, focusing on events through history and historical fables. The Decemberists' live show is especially unique for its level of audience interaction. The band will often act out songs, asking audiences not only to sing but to get up onstage and assist with the re-enactments of ancient dramas and seafaring warrior while the musicians play, making every show a truly one-of-a-kind experience!! Don’t miss out on all this and more! Get your tickets to see The Decemberists NOW before they go!